Charlie Coyle is on a roll. The most valuable player two years ago for Thayer Academy in suburban Boston, he followed that by being named rookie of the year in the Eastern Junior Hockey League and was accepted to Boston University. Last month, he proved at the NHL Scouting Combine to be one of the strongest players eligible for the 2010 Entry Draft. Ranked No. 24 among North American skaters by NHL Central Scouting for the June 25-26 selection shebang, Coyle is a 6-foot-2, 202-pounder who can play center or right wing and is seen as one of the most physically imposing players in the draft. Coyle finished in the top 10 at the Combine in a number of important categories: the Wingate Cycle Ergometer, which measures anaerobic fitness; the VO2 Max test, which measures a player's aerobic fitness; leg power; grip strength; and pull strength. In hockey terms, it means the strongest guy on the ice also has the most endurance -- the big guy can bring it all night long. Coyle has been on scouts' radar since he was 14 after dominating Massachusetts' South Shore youth-hockey leagues for several years. Like his cousin, former NHL All-Star Tony Amonte, Coyle attended Thayer Academy two years ago, where his strong game caught the attention of pro and college scouts. 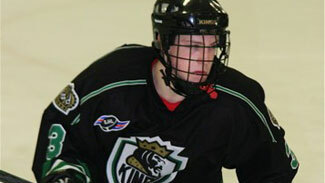 Like Amonte, Coyle plans to play at BU. "I'm excited for him. I hope he goes high," said Amonte, who had 416 goals and 900 points in 1,174 NHL games over 16 seasons with the New York Rangers, Chicago Blackhawks, Phoenix Coyotes, Philadelphia Flyers and Calgary Flames. "He's an unbelievable kid and an unbelievable hockey player. He worked hard in school this year, double the course load, so that he could go to BU in the fall. He has a love for the game. I remember him five or six years ago rollerblading around with a stick in his hands. He always had the stick in his hands. "He thinks about hockey all day long. He wants to be great and he really pushed himself. About six years ago, his dad, Chuck, who was a heck of a hockey player and a real workhorse but never got the exposure Charlie is getting, invited me to come see him play against his cousin. I could see he thought the game three steps ahead of everyone and he had the moves. He knew where the puck was going and how to get it to his teammates." Instead of going straight from Thayer to BU like Amonte, however, Coyle took a slightly different path. He left Thayer and its stringent academic program for Weymouth High School and played last season for the South Shore Kings in the EJHL. Coyle said he improved a lot under Thayer coach Larry Rooney, but thought he also could get top-notch instruction from Kings coach Scott Harlow, who played New England junior hockey with the elder Chuck Coyle. Plus, Harlow coached Coyle previously in clinics and on youth-hockey teams. "I love playing for Scott," Coyle said. "He played junior with my dad on the South Shore Braves. They're really good friends. "I was going to stay at Thayer, but I reviewed my options and thought the EJHL was the next place for me. So I went that route and BU talked to me and said there might be room for me this year. Thayer wouldn't let me accelerate as a senior, so I went back to my old high school. "The New England prep league and the EJHL are both pretty fast leagues, but I thought the EJHL had stronger players and they're older. I felt like I was kind of a step ahead. I felt that was the next step to get to BU, so I went with that one. It worked out." It certainly did. Coyle was named the league's top rookie after totaling 21 goals, 42 assists and 50 penalty minutes in 42 games. He had 6 goals and 18 assists on power plays and 3 goals and 2 assists while shorthanded. It looks like Coyle is on a hockey-oriented odyssey, never staying in one place too long while hopefully en route to an NHL career, but academics remain important to him. He left the NHL Scouting Combine last month to return to Weymouth High to finish a few courses and hopefully make the honor roll. Coyle was awarded the 2010 John Carlton Memorial Award by the Boston Bruins for his athletic and scholastic achievement. The Boston Globe and Quincy Patriot-News named him to their all-scholastic hockey teams. Coyle's strengths are his speed, strength, size, stickhandling and unselfishness. He helped power-play partner Chris Wagner (No. 136 on Central Scouting's final list) to the EJHL scoring title this season. Amonte is thrilled that Coyle has chosen Boston University. Amonte played two years for the Terriers under coach Jack Parker, including a trip to the 1991 NCAA Championship Game, won by Northern Michigan 8-7. "I love it," Amonte said of Coyle going to BU. "He's going to wear No. 3, the number he wanted. He's a perfect fit for them and there's a lot of opportunity to step in and play. They lose (Ducks prospect) Nick Bonino, who created a lot of offense. What do they have down the middle? They don't have an offensive center. Eventually, there's going to be a lot of pressure to produce on Charlie. "He won't need much work on how to play in the defensive zone. He knows how to get it done and he works hard. (BU coach) Jack Parker will teach him a lot about the game and preparation for the game." Coyle said he needs to improve his acceleration, and to do that he'll train this summer with legendary fitness coach Mike Boyle in Winchester, Mass. Boyle long has trained BU athletes, so Coyle is joining a program tailored to his next team. "I've never trained with Mike Boyle before, but I've heard great things about him and I can't wait to get there," Coyle said. Coyle appears to be on a rising curve. 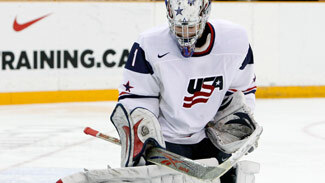 He tried out unsuccessfully for several USA Hockey teams before making his first one last summer. He was on U.S. teams that played in the Memorial of Ivan Hlinka Tournament in August in Slovakia and the Four Nations Cup in Finland in November. "It was the first time I've been out of the USA and I got to play with some of the guys who will be in this Draft," Coyle said. "It was nice to be with them in Slovakia and at Four Nations in November, playing with the national team. That was pretty special, as well. They were a great group of guys and a great team." Coyle had the game-winning goal in the Four Nations Cup finale against Switzerland to give Team USA a perfect 3-0-0 record and the championship. It's just been that kind of year for the big guy.